Pretzel Logic's Market Charts and Analysis: SPX and Crude Oil Update: Rally Ready to Roll Over for Good? 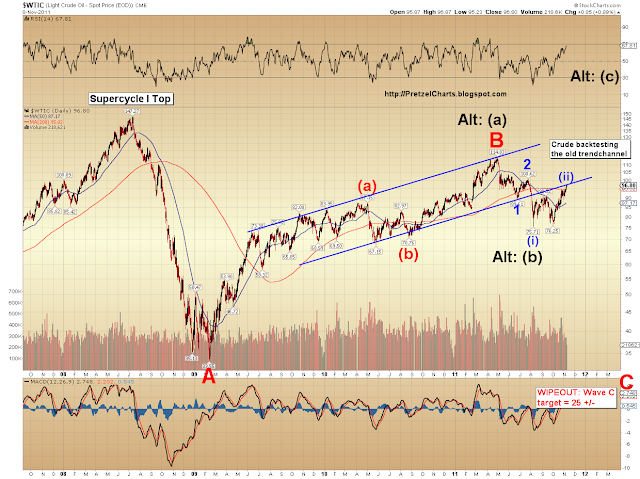 SPX and Crude Oil Update: Rally Ready to Roll Over for Good? I'm going to keep this update short and sweet. Yesterday, the charts looked muddled, and to some extent, they still do -- I've noticed over the years that this almost always happens in the charts when the market is making an important top. I was looking for a reversal yesterday, but I usually tend to be a day or so early for those, at least when I'm calling tops before they actually happen. Did the same thing on October 27; I was a day early. Maybe one day I'll figure out how to compensate for that. Anyway, as a result of yesterday's action, there are really two main counts I'm focussed on now: the preferred count I've stuck to since late October, which says October 27 was a major top; and the alternate count which suggests the S&P 500 could make a slightly higher high for the move. In both cases, I am of the view that this is a bear market rally; and it should get ugly fast when it rolls over, as hoards of Johnny-come-lately bulls will be jamming the exit doors trying to get out. If you're just joining the discussion, it's helpful to review my big picture outlook for the market. Note that I haven't updated that article's long-term chart since October 3, largely because I haven't really needed to. Over the past few days, I have presented several indicators regarding sentiment, and discussed how these indicators were arguing that a top was being made. In the market update for Monday, we examined Rydex bull funds (retail investors), which had reached record money flow levels. In Tuesday's update, we looked at the ratio of money flowing into the Nasdaq vs. the NYSE, which had also reached record levels. The point I really want to stress here is that this level of extreme bullish sentiment is simply not consistent with a bottom in the market. Let me repeat that: bullish sentiment is not consistent with a baby bull market. Remember March 2009? People were convinced the market was going to zero. Even at the October 4 low (remember way back then? Like a month ago? ), most were convinced the market was going to crash, not put together a monster rally. Compare that with today, when there's more money going into risky stocks and bullish funds than ever before. This type of sentiment is consistent with a top, not a bottom. The market is all about fear and greed. When the market reaches extremes of either emotion, a reversal is usually nearby. This first chart shows my preferred count. With the additional puzzle piece of Monday's price action, I am now about 70% convinced that this latest counter-trend rally is over. 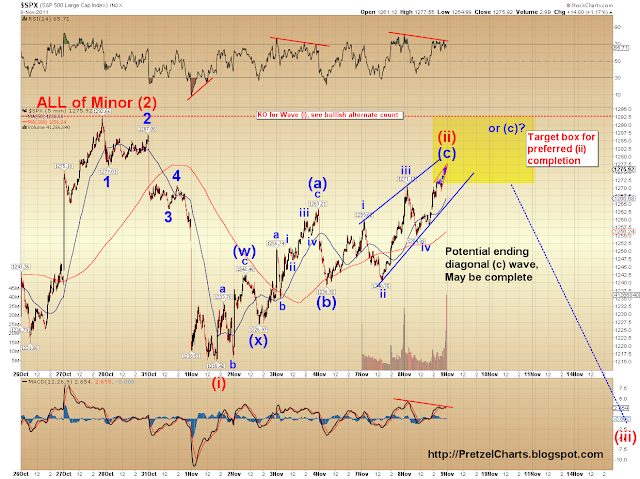 There could be one more quick drop followed by a marginal new high (see blue "or (c)?" label), but I'm not favoring it. However, the level on this chart which is critical for the bulls first defense is 1238-1240. Until bears break those levels, new highs can't be ruled out. But if those levels go, that will almost certainly leave the bulls in trouble. And if this formation is an ending diagonal, those levels will probably get tested pretty quickly when it breaks. One reason those levels are so critical is because breaking them will eliminate the option that this formation is a leading diagonal. A leading diagonal would be consistent with the bullish alternate count (shown below), which considers the possibility that the market is in the beginning stages of wave c up to new highs (early targets are for 1305-1330). 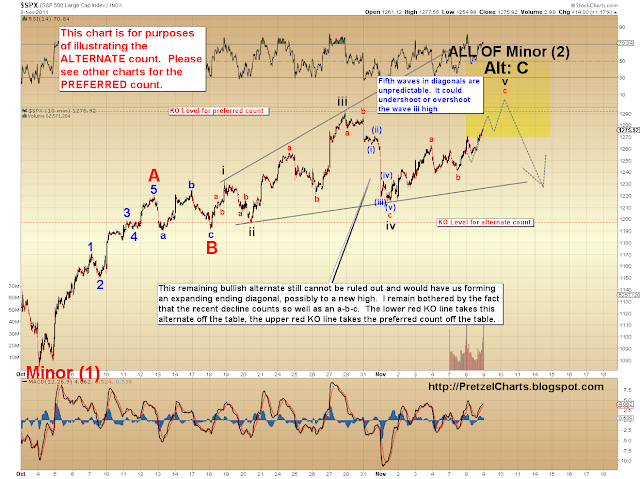 If the bullish alternate count is unfolding, then this diagonal is wave 1 of red c on the chart below. I should also note that breaking 1238-1240 still can't eliminate the bullish alternate count. I don't know that it would help to launch into a huge and confusing explanation as to why, so you're just going to have to trust me on this: 1197 is the level that eliminates the bullish alternate. Even though the market has pushed up close to the knockout level for my preferred count (above), I continue to only give 30% odds to this bullish alternate (below). One last chart to add; I'm sharing this primarily because a number of readers have requested it. The chart is an update to my long-term count of crude oil. The last chart I posted was on September 9, but if you check the old chart, crude has played out pretty closely since -- however, the old chart did require some slight adjustments to the labeling. From the looks of it, crude is currently in the process of backtesting the broken blue trendchannel, in the mid-$90 range. If the preferred count shown on this chart is correct, crude is forming a nested series of first and second waves, and could collapse dramatically when it turns. I am currently favoring the preferred count by a 90% margin, based on my analysis of other markets, such as the dollar, copper, and equities. However, the black alternate count cannot be ruled out yet, and, strangely, results in the exact opposite effect from the preferred count. So, one way or another, crude is likely gearing up for a monster move. To sum it all up, I think this rally is almost certainly over... but pay attention to the levels listed above for confirmation. The next leg down could be brutal. Preliminary targets for the first leg of the next move down are in the mid-1100's, but that could change as it unfolds. Once we get some confirmation, I'll start refining the targets. Ultimately, the larger-degree wave should take the SPX into the 800's or lower, although that will take some time, and there'll be rallies along the way. Trade safe! Just found your blog yesterday and I find your analysis is a great check on my gut and TA. Keep up the great work! Looking forward to my regular readers waking up to see the futures... assuming of course the bulls don't pull out another miracle reversal here. Thinking they don't today, though... if my charting's right, this one's for real. wow, just woke up and saw futures were down 240 on djia. Glad i held onto most of my shorts yesterday despite my desire to dump them. question now...will this move down be a 3 of 3 or a C. Going to get interesting at the 1190-1215 area. Mornin' Rock. Glad you didn't get chased out yesterday. Yep, the C option is still out there, but I'm not going to focus on it until it's necessary. Was just checking on the dollar... dollar broke above its falling ST trendline and is now approaching the neckline of an inverted head and shoulders, which, if it breaks, should launch it right into the 80-81 resistance level. I'm thinking it might need to do some backing and filling first, before it breaks out of the neckline. One of the things I really liked in the SPX chart, which I didn't mention in the article, was the ending diagonal WITHIN the larger ending diagonal. You can see it in the red trendlines at the end of the move. I saw the exact same thing at the March '09 bottom. That one was killer, I hit that within about 2 points. Made 2000% on a bunch of SPX OTM call options... and actually could have done better had I been more greedy. NB it was me posting the Ifo EZ index stuff earlier. Oh, whoops, got confused at to yer name vs the link. Nevermind. Rolf is prolly simple enough to type. Is your crude chart logarithmic? It looks like mine but the trend channel does not fit. Unless I uncheck for logarithmic. Does a trend channel have as much value if not on logarithmic scale? Just woke up to get a glass of water and saw the futures. Wow, what a surprise (jk). Dollar rallying strongly, oil down, gold down and all equity indexes tanking. And (surprise, surprise) CNBC is talking about problems in Europe and Italian bonds are now up past a 7% yield. No one could have seen that one coming, right? That wasn't telegraphed well in advance. The several days of trading are now looking like they were simply one giant trap for bulls and last to the party longs. And also served to take out most short positions. Ah, the market is so clever. So let's see: Bull sentiment rises to virtual insanity levels, coupled with bears buying into the notion that nothing will stop the bull advance . . . and then the news breaks a few bad news stories about Italy and the Eurozone. Hmmmm. No one should have seen THAT one coming, right? Because bad news stories NEVER break at bull sentiment crescendos and when the market is peaking. Never ever. I shouldn't be laughing. Looks like lot of naive longs (I've been there myself) are about to get their positions wiped out again by the caprices and machinations of the Street. And yeah, this time the move down looks very 'for real'. The start of another massive sentiment shift back to reality. And a return to the understanding that this is not a healthy economic environment and you engage in equity exuberance after market run ups at your own risk. Which will probably last only as long as it takes for the indexes to run back up again . . .
Oh and Pretz: I was going to say in last post: You don't need to justify your work to a detractor. The quality (and quantity) of your efforts speaks for itself. You have a GROWING following for a reason. Congrats on *hypothetically* going short at 1,271 btw. I probably would have gone in twice as much as I'm in now had the market risen past 1,280 and was showing clear signs of a reversal. Looks like that opportunity won't be available. Pretzel...only been following you for a couple weeks, but your blog is becoming one of my regular stops! I'm trying to learn some Elliot Wave and your insight is fantastic. George, ugh. Big oversight there, lol. I don't trade crude, but you are absolutely correct that it should have been done log scale. I meant to, but apparently forgot the first time, then didn't even look when I updated it. Don't have time to update it with the whole count, but I'm going to do a quick fix new chart for it. Should be fun watching CNBC and Bloomberg tonight to hear all the explanations of what exactly changed so radically in Europe over the last 12-24 hours. TY George. Quick fix, but good enough fer government work. Pretzel, i remember you wrote an article on copper, but did you also say something about silver? I think that is poised to drop, but would like to hear your views. By the way, great job sticking to the bearish stance. TY Vulture, me too. Got pretty darn hard at the end there... used to running solo on this stuff. The public eye brings a sort of "peer pressure" I'm not familiar with. kg, thanks, and I'll see what I can do there. Brian, this seems to be a definite wake up call for bulls. jaco, yep. "Investors panicked today when they learned that the London Bridge was in London, and not in Paris as previously believed." Gotta package this all and get it sent to Minyanville real fast, so I'll get back to you in a few here. Dollar is flirting with the neckline on the reverse head and shoulders. Might get a launch if they can sustain a move over it. Re: silver. I don't really track silver as carefully as I would need to to have a really "good" opinion on it. My current stance is neutral, but honestly, there are probably a lot of people who track it more thoroughly than me. Anon20 actually seems to be pretty well versed on silver, so he might be the guy to speak to there. btw, kudos to Jaco...yesterday in here he was screaming 'top' at 1276. Bulls might finally get a little something going from these levels. Looks like a clean 5 down in ES futures and a clean 5 up in the dollar. Let's see what they can bring for a bounce. A dollar launch possibly unfolding. It's still early morning and the latest European headlines are just a few hours old. Should be interesting to see what happens in the dollar market once the Italy bond 'crisis' and the need for a bailout becomes the dominant headline and CNBC chatter as the week progresses. Amazing how those numbers work. The indicators I looked at definitely suggested some type of pullback. As strongly as I felt about it though, I wasn't taking more exposure. I think Jaco got in, great entry point!! Once this decline gets real, I'm guessing that the well-deserved donations will flow. For those of us that have been in cash waiting to go short (hypothetically), please help identify a good entry point. I'm guessing there will be a better one after the morning gap. kg- there is already an option under each post for facebook, google, etc. Blogger won't let me make it any larger (apparently it goes unnoticed). I also just added a facebook "share" thingee under the market ticker. Pretzel - you rock! Your analysis gave me the conviction to stick with some losing positions longer than I otherwise would have. Thanks again. Anyone have a cool $100 billion laying around to buy Italian bonds to push those yields down? Funny watching Cramer just now shouting emphatically over the other CNBC talking head that *someone* has to step up and be 'Winston Churchill' and buy $100 billion worth of Italian bonds TODAY (and it can't be delayed until tomorrow) . . . or a cascade of effects on the worlds financial markets unfolds. Talking heads then went on to tell their viewership not to buy equities today. And 'Bracing for the Selloff' is the lead bar on the screen. I'd say that's as good a change sentiment indicator as any. what levels should we be concerned about for potential bounces? 1240? Does it have to be a sustained trade under those levels? Who would buy those bonds knowing they'll be asked to take a haircut as Greek bondholders did ? 8% is worthless when they default or as part of a bailout they lose 1/2 their value. I have followed your blog for about a month. great work and awesome insight. I got stopped out yesterday. Never fails, wish I would have stayed the course. SpikerJ, I think there is some support around 1240 for ES, you may want to see if cash breaks through at easily, if not wait for a rebound from there. How long til we see JH interviewed on CNBC? And will that signal a bottom :) ? Basically right TJ. 1238/1240 cash SPX are levels bears need to break. If we break those levels at all, we can KO the leading diagonal and really, just about guarantee we'll at least break the early November low. Not 100% guarantee, obviously. But as good as it gets in this biz. Thanks TJN, Pretz. I see this morning as an example of why you like to trade the futures. You had time to analyze after the close and take a position before the open. Just remember not to get complacent, everybody. Stay nimble. Spiker, 'zactly. Plus with futures, I can hop in and out like nothing. I'll close positions near support or potential reversal zones even ST, then jump back in at higher levels... or even re-open those positions if the support levels get broken. Just gives a lot more flexibility, because I don't have to worry about the market running away from me in the overnight session. If you'll remember 2008, there were so many big moves overnight. I remember we had a lock-limit down day, even. I think it was October '08. As welcome as this is, I can think of one thing in particular to make it better. I would love to see bears crush that afternoon rally that we've been seeing and drop us comfortably below 1239 this afternoon. If we get a bounce off 1240, where do you see it peaking? I am ready to be bearish now. Can I join the bear camp? Frank, the bear camp has a big enough tent for us to include you. Although, it makes me nervous as a possible contrarian indicator... lol. Dollar broke out of the inverted head/shoulders, looks like it's going to back-test. Need to see that hold, obviously. Euro looks like the bottom could fall out if 1.36 goes with conviction. Bears need to get 'er done today. Critical day going forward. Right there with you Green. And then lets see us take out that 1,218 November low for good measure. 20 dma is at 1,240. That's an important line to break. Not surprising bulls are putting up a fight here. 50 dma is around 1,200. If we get to there, it'll be interesting to see how far down it goes from there. But that's getting WAY ahead of ourselves. Good point, Frank. Was thinking about taking some profits, but I think it's better hold shorts for the longer term move. If this is indeed a once-in-a-life time bear move, I'd probably try to sit tight here :-) Remember, it's about the sitting that makes you the most money, not the thinking! Is the $VIX forming a stair case uptrend now like back in 2008? Frank, exactly. If this is wave 3 down, it will break up into subwaves. The first subwave (1 of 3) should take out the October lows. Then we'll rally in wave 2 of 3. Probably the safest entry I can think of will be where wave 3 takes out the wave 1 of 3 low. That's where the waterfall will probably start. Should be plenty of opportunities between here and there. Oh brother. I'm not sure if the tent is big enough... I forgot about Frank and his randomly-specific questions. Do you think Johnson and Johnson really IS a family company? Silver will be a good commodity to short with plenty of downside :-) Gold I'd stay away from because it tends to hold up the best among all commodities class. If we get into a forced selling situation soon, silver will tumble as it did in 2008. TJ, you KNOW I can't give trading advice. Honestly, the move is so young as far as structure -- and the turn is, while very promising, still not a given. So use your best judgment. I put it all out there w/ the update... beyond that, it's a bit wait-and-see at the moment. Interesting that Pretzel feels that bears need to break key levels today. I see todays move not so much as a game changer, but a momentum change for the bears, so long as they can hold off the PM bull rally. BTW as far as key Fib levels for 1244.93 is the 38.2% level. I'll feel decent as long as we stay below that, even if not all the way below 1239. I am wondering if there will be any more magical intraday reversal... hm.. Thanks for the welcomne yeaterday Pretzel!. It appears that I have been struck by kryptonite and my fadelicious powers are momentarily on the wane. Thanks for the reference, but I have to point out that it had been your mention of the Fibonacci retracement that made me watch 1276 in the first place. I really enjoyed your take on the "news". LOL. On the way jome from work I heard the worldwide drop had been due to the Italian bond rate being at "record levels". Really? And yestrday when they were at record levels? Why are the talking heads never asked the really tough questions like: "Hey emperor, where are your clothes?" Green, I don't know that they need to break 'em all *today*, not really exactly what I meant. But bears need to hold bully down and kick him for sure. No late bullish momentum shifters in other words. I'm waiting for a 1237 print to add shorts. That's 'my' safe entry. thanks Jaco...I realized we were so close to the top at this point, might as well stick it out. Another leader steps down to spur a rally ! I'd really like to see the Dow take out 11,850.68 to completely rule out the leading diagonal. Came w/in 3 points so far. But it's not like I'm even close to being immune to being wrong, so I'm always watching out for bull stampedes on the horizon. lol, does it really matter who the next greece PM is? come on, this story is played out. I'm a penn stater, we all expected him to retire after the nebraska game anyway, unfortunate this controversey will overshadow his stepping down. Everybody up here is bummed about this scandal. In a perfect world, that's the wave 1 bottom at 1240. Now we see what they can put together for retracement. More leaders stepping down, lol. Bernanke's got nothin' on these guys. Nittany Lions gonna bail out Europe! Dollar holding support at the neckline back-test so far. Question about your count from someone with little EW experience - how come you have the w, (x), embedded in the a-b-c wave ii? Could the a subwave just count as a more familiar 1,2,3,4,5? Sorry if this is confusing. Thanks. Anon, no problem. There are rules governing structure, so it's not as simple as labeling things with numbers, the waves have to follow the structural rules. That's what gives EWT its predictive value. In the case of the example you're citing, there's too much overlap in the structure for it to be one impulse wave (impulse is a 5-wave move). Assuming this is wave 2 up, 1254-1263 would be the target range. Retracement seems in full swing. Does this turn into ANOTHER dramatic afternoon rally of the mid-morning lows? Four days in a row. That doesn't *seem* nearly likely at this point. Maybe the street wants to scare a few shorts out of positions taken on the way down. Or committed bears wanting a pause to take more short positions before a push past resistance. Not sure what could spur an actual rally back up to 1,270 at this point. But stranger things have happened. The Italian bond crisis story line is rather reassuring to the bear thesis. It's the kind that has legs for weeks on end. And which can fundamentally and swiftly change the recent perception of the equity market is suddenly a profitable place to put your money again. Just saw that the Euro is now down 2% vs. the dollar. Should the dollar rally and the Italy story line intensify, I think the bulls start to really give up ground. I feel pretty good about this one. Everything lines up, structure down looks good, nice and clean impulsively... Bully could always throw a curve, but it doesn't get much more promising than this. Hey Pretz, I was wondering how the S&P compares to the Russell 1000? Like the correlation between them. Thoughts? We've got sentiment, structure, and fundamentals working for the bear case. Bully has the printing press and the national media. Beyond that, this morning gap down is EXACTLY how you'd expect a third wave down to kick off. So, like I said, it doesn't get any more promising than this. curious about the 08 crash...how did the market treat gaps to the downside? did it cover most/all of them with retracements? We should watch the dax here, its driving this market IMO. the low today was at the DAX's neckline...need it to break, seems to coincide with our 1238 level nicely. That's the tough thing about Elliott Wave. It is nothing even *approaching* a mechanical system. I have to look at each chart individually and break them each down individually. It's the TA equivalent of hand-made artwork, and it's massively time consuming. Tx for providing a bounce target: "Assuming this is wave 2 up, 1254-1263 would be the target range." Rocky, some got left behind and filled after March '09. pretz: looks like you NAILED it. splendid job. Don't worry about being a day early with calling a top; we'll factor it in. If you start to be "johhny-on-the-spot", we'll be a day late... and look at today. i purposefully didn't check the markets until now (8:30am) and then read your new blog post. Before I read it I already knew what you'd written: confirming today. Some comments from today and yesterday confuse me as some argued yesterday News was not driving the markets and now it is.... This was a hot-air-balloon all along and it's getting more and more holes IMHO. It's not crashing to the ground yet; we need bigger ammo for that. That 45mm caliber gun will be China. Funny fact: as stated before I am a bull at heart and was surprised to hear my own chuckling seeing red (-2%) anywhere. Now I know why: the market starts to make sense. The last weeks/days have been very confusing and I hate that. Kudos to those who shorted at the top yday! ps: today didn't break down through the ~1240 area (yet), that's also something the bears need to keep in mind. No hallelujah's yet... but it might be coming? So maybe we just saw an a and are starting a b of this subwave 2? So we could go back to 1244ish, then up to 1254-1263, then comes 3 of iii? Or am I off base? New to EWT. Thanks for answering my w(x) question Pretz. "News driven market", they say.... Pellleaaaaze!! I'll be curious to see how it impacts his cycles. If you recall, 11/4 was supposed to be the cycle top, +/-1 day. Monday was the +1 day. That's why he bailed on the bear cause on Tuesday with the futures up, because it was clear that Monday wasn't going to be a top. Now we're +3 days, so the move is clearly not at all in sync with that cycle projection. I imagine 11/11 is meaningless at this point, but I'm not a cycle expert. Arnie, thanks. 90% certain, yes. Anon, you've got the basic idea right. true, I just thought maybe there was an error in his calculations or if it could be +/-2 days, because then it would fit. But then again, the +/- 2 days weakens the predictive value of the cycle. Glad that Pretzel is still around. Seems no one else can play the part of Cerberus and keep bully coralled. Yeah, that would be basically worthless, predictive wise. That would give a 5 day window! Pretty much any 5 days in the market is going to have a top of SOME kind. Green, funny you say that... I was just about to sign off for a while. Gotta get some sleep. 7:30 a.m. here, and I only got 4 hours yesterday. Only made it this far on adrenaline with the mini-crash this morning. trend change today...AM low, afternoon melt up, but late selloff...thats my guess atleast. I think we get another test of 1,240 later. 1,252 may just be the high for corrective wave with shorts saving their ammo for the closing hour. Not sure how bulls could think today that they have the bullets to take things back up past 1,260 and stay there. Let's get this wave 3 party going full speed down. And do get some rest, Pretz. As usual, your calls are uncannily prescient. Bears seem to be nicely on track right now. If I were long right now, I'd be expecting the bear onslaught to come later on. With this little leg down just serving notice that the V-shape runs back up are not in the cards today. If the Street pros (and their computer bots) who are expecting a run down to new lows can't mount a serious push downward this afternoon, I don't know where they'd do it. The primary goal for them today should be to really kill off bull hopes heading into tomorrow and the end of the week. Here comes the counter trend rally buckle up guys. That was weak. I agree with those calling for LOD in last hour of trading. @JACO. I agree with the fact that today's news is nothing new(er) then yesterday, though we see a completely different picture. That's why I think the past rally was a hot-air-balloon. Looks like more downside to come today, but that won't be news driven. A real bear market falls on no news and rally on good news. I don't know, anon. If I were holding long right now, I'd really not be feeling good about how that last hour just went. Those are the kinds of hours that make a bull give up any pretense of putting up a fight in the closing hours. Every attempt at an advance was answered by bears. I thought the big tell was at the 12:55 mark there was a green volume spike when the one minute RSI and Stochastics were heading bullish. The bears answered decisively two minutes later. And (so far) that has been the end of that. Potus so you're saying this is B? I always thought the market does what it does.. and when it does what it does, the media just tries come up with something to alibi the buying/selling. I think it's just better to focus on the tape. And I had to smile when Credit Agricole's Talking Head said that t market was taken by surprise as he reckoned "No one could see this one coming"
I agree it was all hot air, but I go further in that I don't belief the news had anything to do with it ever. The "news" is merely after the fact dot-connecting by clueless talking heads. Frank you are correct. They ALWAYS attach a reason. Some weeks its comical as they'll use the same one back to back days - Market rallies from Europe relief. Next day - market down over Europe fears. Funds are generally dumping and buying off daily headlines. It's sort of laughable. The headlines DO impact the direction of the markets immensely. Because you need the average joe and fund manager reading those headlines and behaving accordingly. I also think the headlines are USED by those who move markets to produce the trend in which they'd like to see things travel. And after rising to 1,275 and clearing out all shorts on the way up, fueling bull fire and scaring the bejesus out of bears everywhere . . . it only made logical sense to make that trend move downward. Hence the stark change in the news reporting starting this morning. You can almost take it to the bank these days that the headlines are about to turn very and decisively negative after a run of positive reporting. Another rendezvous with 1,240 on the way again. With the bulls now completely softened up, I think we break through decisively here. I'm pretty sure that by now all market participants can see the writing on the wall. And yesterday all hope was given up that the bear crowd would ever assert themselves again. Today they seem to be playing it masterfully. That it, just took out 1238.92 !!!! boom 1238 is gone! This site just became my new favorite! ouch; bye-bye 1240-1238. that must have hurt. what's the next level of resistance we're looking at? 1220 or 1200? not sure. I prefer 1220.
ake that, bully! Teach you to try to those V shaped recoveries on us a fourth f-ing day in a row! Ha, ha. Looks like the bears are on their way to scoring a very decisive victory this session. If I were wanting to defend this bear advance, I would be saving my bullets for that 1,218 mark at this point. But I'm not. In fact I'd have sold everything in the first half hour of trading today if I were holding long. Even better than the push past 1,240: Dollar is advancing. May push past 78 pretty quick here. If I remember correctly, Pretz thought it would head up to 80+ pretty soon here. If that happens, then it's probably smooth sailing below 1,220 as well. Oh and look: here comes 1,230. That took just a hot second. This is now turning into an utter bull rout. And just one day after bears were starting to believe that bulls would rule the world into the end of the year. My how things change with Mr. Market. Not asking from a EWT/TA perspective, but the mindset of fellow traders. Would a close below 1237 open a greater chance for a dead cat bounce tomorrow? I'd rather not see one myself. Thoughts? At this point, we should welcome any dead cat bounces to offer historic value into selling for short-and-hold investors. Things looking pretty dark out there. The saying goes it's always darkest before pit black. That's true Frank, are you expecting a bounce? I wouldn't at any level but I think we've gone low enough for one now. I might just take some profit now and look for another entry if we get a bounce tomorrow. Your guess is as good as mine. I would just look at my MACD and Stochastics to look into the dead cat bounces or just "ledges" to sell into. Sometimes if the market is so weak you may not even get a bounce but just a ledge, like the lunch hour today. Another thing you can do is just add to your short on a price basis. Add shorts when you gain a X% gain and average "down" your cost.. sorry no pun intended. I think sentiment massively changes the moment we print below 1,200 and the Dow is decidedly below 11,500 again. Those are such a psychologically impactful numbers for investment sentiment. And below the 50 dma is important for the street savvy pro to turn totally bearish. The retail guy probably doesn't know what that means. But every pro does. Thinking it through: this is just the first day of the decline. The retail investor who'd unload in a panic probably isn't in on this move yet. You think any fund manager is going to buy heavily into the teeth of this at above 1,230? No f-ing way is my guess (which is just a guess). It's virtually suicidal. Tomorrow through Monday the average retail investor is responding to margin calls and panic selling. One thing is certain: the market made the indexes 'match' the Italy news today. Outlook and sentiment now turns decidedly grim from here. And we can probably kiss fantasies of 1,300 plus goodbye at this point. The Italian news story is one of those that has legs for weeks and into months. With no, easy pat solution. And the ability to lead to even more catastrophic outcomes. Is it not also possible that the market simply does what it does, while all kinds of stuff happens? So on any given day when the markets go (say) south there whould be all kinds of stories to pick and choose from. It good also be that on that particular day two particularly big news stories hit the newsrooms, (on the face of it) one bullish, one bearish. The news editor then emphasises the "bad news" story as it seems to be more relevant to the market on that day. In reality, of course, millions of things influenced the market that day, not just one story, but nobody wants "facts" to interfere with a good story. "The pattern in the US has been sell in the morning and buy in the afternoon," adds Brian Kelly, but if that doesn’t happen on Wednesday, get short, very short." hmm, retest of 1238? should fail...another shorting op for those that didn't get in yet to the downside? I'll start covering once we break below 1220...flat cash by 1197 and wait for a break below 1190 to get back into shorts...my gameplan, let's see if it pays off. Jaco, your theory is entirely plausible. On CNBC, Bloomberg, the WSJ, Yahoo this morning it was OBVIOUS what message they were pushing: SELL NOW!!! And when the market is at a high I TRUST that message. But when it's near a LOW I don't. Vice versa for high-water market points. I don't trust the positive spin cycle. But uptrend in the morning futures, positive reporting, more positive news by midday, another V-shaped mid-morning recovery, HOD close. The market was screaming too loudly and obviously: GET IN NOW. And it delivered the goods up until 3:59 pm. So it was really all just a trap. The whole last several days of trading were. The market still needed to go higher and it did so DESPITE yesterday's Italian circus - not BECAUSE of it. By today everybody found themselves on the same side of the market, so it really only had one way to go. This time round the news happened to make a little more sense, but the poor talking heads were faced with the conundrum of explaining two massively different outcomes from essentially the same fundamental base. 5th wave into the LOD close? Looking at charts of 1987, it started on a Wed, 10/14, after Dow closed on Tuesday around 2500. By Black Monday Dow was around 1750. 30% drop in four trading days. not saying it's the most likely outcome, but I don't want to miss something like that being too cute and trading in between too much. this is too far too fast for me...taking a little off here. I feel like we need a true retest of 1238 before we dump below 1215. Maybe I'm wrong. haha nice, thank god i didn't sell yesterday. Adding to shorts now. lol, i think ur right vulture. I was basically 100% short by lunchtime today (a lot of VXX), feel greedy not to leave some dry powder for tomorrow. I have a feeling we'll retrace a bit tomorrow AM and That's when I'll add more. I'm still on the bear train though! Funny vulture. Whether we close above or below 1,230 today. Bears accomplished everything you could ask of them this session. That retrace up to 1,236ish looks like a nice complete wave to me. Tooday's events starts the waves of margin calls and quickly setting in panic that can take things much lower from here. And there is NO WAY that the Italian bond story magically gets better by the end of the week. That storyline will have some staying power and the unfolding dramas that go with it. Wonder how the Italian populace is feeling right now. Not good, I am sure. And that is how the bears answer three days of bull mularky rallys! Masterfully played by the Street's pro short sellers today. Actually, rather masterfully played the last several days by the Street. I'm sure the bots algos performed exactly as they are programmed for a nice, big, panic inducing downward move. Tomorrow should be rather interesting. And I am rather looking forward to Pretz's update. All of us who have benefitted from his insights should be showing him some 'support' after this is all over. The man has certainly earned it. Not sure if he's okay with me adding in a plug for him, but it certainly doesn't strike me as a bad thing. Yep, I just hit the donate button, so I guess I won't stay Anonymous. Thanks for the great day, Pretzel! well, I've only been reading this blog for just one day but I feel like I need to hit the donate button. I almost got out of my spreads yesterday afternoon for a 1-2% profit. I hung in there after reading this site and the comments and now I'm looking at an awesome month! Yes, Vulture, that is indeed a Bear looking around for any lurking bulls. This article was published two days ago. The author actually cites 1) the US Economy 2) The Politics of Washington DC and 3) US Economic growth . . . as the three things that will come together nicely to mean that equities are attractively priced today!!! And he thinks that equity sentiment is currently too negative. Wrapping up a few things at Toulouse, a few thoughts that have run through my mind since the market close. Would be curious to hear other's impressions. And I am particularly excited to see Pretz's updated counts. I thought today was extremely encouraging for the case that price discovery will head toward below 1,200 soon. Today's stop in the waterfall move at 1,230 was particularly well-timed. If I am a sentient entity called 'the market' and I am dastardly and scheming want to take the market down well below the 50 dma and then so, I would do that by forceful steps that in excruciating succession breaks the will and confidence of those holding long. First stop was 1,240. Broke through that like a hot knife through butter after landing hard jabs and body blows to all meaningful bull attempts prior to 1 pm. And when the push through 1,240 came it was OBVIOUS to all participants that there is no trying to stop it. Next is 1,220 and then the 50 dma just below 1,200. By stopping just below 1,230 today, bears have kept their firepower saved for when the 1,220 and 1,200 tests will come. Barring some bull miracle, everyone knows those tests are coming. And by slowing the downward advance today, the bears get to paint nice big red successive candlesticks on the daily chart. Stopping today at 1,230 also allows those holding long to get scared overnight, see their margin calls, pick what to sell. And for the tension to successively build. And when the break of 1,220 and then 1,200 comes, it tells longs that Mr. Bear is for real (this time) and there is no use standing in his way. The long reds candlestick breaking through resistance on the daily and sixty minute chart can pile up and paint an undeniable picture. I don't want to feel over-confident, but it's now REALLY hard to imagine a set of circumstances or some news event that stops this. The Italy bond story has the feeling of being a back breaker for the equity markets. It's worse than Greece, insofar as it starkly exposes the entire Euro edifice for being an unsustainable arrangement. It cannot possibly be maintained in it's current form. And we haven't even heard from Spain, Portugal and Ireland yet. And whatever other sovereign debts will need to be written down. Which if that happens in Euros, you can probably kiss the entire currency goodbye. Or it will necessitate a break up. Either way for equity markets, none of this is good. At all. And crashing investor sentiment seems certain to follow. My thesis could be wrong, but this seems a particularly good start for the wave three bears here have been waiting for. Remember last week when I said it took the bears 2 days to move x number of points and it took the bulls 5 days to get 62% of that back? It just took the bears ONE day to blow through 5 days of bully's firepower here. Not a good sign for the market. Haven't really looked at charts much, but this definitely looks, and feels, like the start of the move we've been waiting for. This is how a 3rd wave feels... relentless grinding lower, and virtually nothing in the way of bounces. Another day like this, and watch how many people start to jump on the "top's in" bandwagon, just like after the 27th... eventually, that'll be the cue for the market to confuse them all again, like it did last week. Frank, you did great! I'm promoting you from "Disgruntled Bull" to "Bear Cub." I haven't read through everyone's comments yet, I'll get there in a minute... just looking at charts. Check out the Apple chart from the weekend article. The green alternate count nailed the top within 25 CENTS. That's .0063%! Amazes me sometimes. This is the stuff I want to show people who say Elliott Wave is all nonsense. Dunno what the statistical probability of nailing a top within a few thousandths of a percentage point is, but seems like they would be astronomically low. All news does is give a quick snapshot of market sentiment. That's it. As someone observed (Vulture? ), the media can take the exact same event and spin it positive or negative. The only exception to this rule is black swan events. No problem! Your work is worth about 1000 times the amount in the donation or at least it was to me today :) for others thinking about donating, it is ridiculously easy and quick. I'm new to EW and now I have a couple of EW books heading my way too. I've been using TA for about 8 years but I've always steered clear of EW... Not sure what changed this week for me but I guess I just woke up curious on Tuesday. I love learning new tools. If it's affirming to you at all: I follow a subscription-based gold and currency blog so that I can keep up on those markets. It will remain unnamed, but the blog author / host routinely offers the opinion that E Wave theory and most TA analysis are 'worthless', which I take to mean: He's not able to employ either with any effectiveness and has blamed the tools themselves. His overall approach is no-nonsense, sound and very conservative. It works and produces sound and dependable returns. Yesterday though, his update offered that new highs for equities were likely, which he apparently deduced from simply looking at the trend channel that had formed on the daily S&P. His opinion (and I am not making this up) was that as long as we don't fall out of that trend channel, the S&P would rise for the next week or two. I found this to be wholly negligent and overly-simplified to the point of thinking: is this what your patronage is paying you for? I was kind of in disbelief. And of course it didn't change my own investment thesis nor question your counts. Anyway, apparently this individual might do well to check into your site from time to time to do some additional research and cross-checking of his conclusions. I'll be curious to read what his explanation for his call was last night, though I'm pretty sure it will be as simple as: The Italians did it. 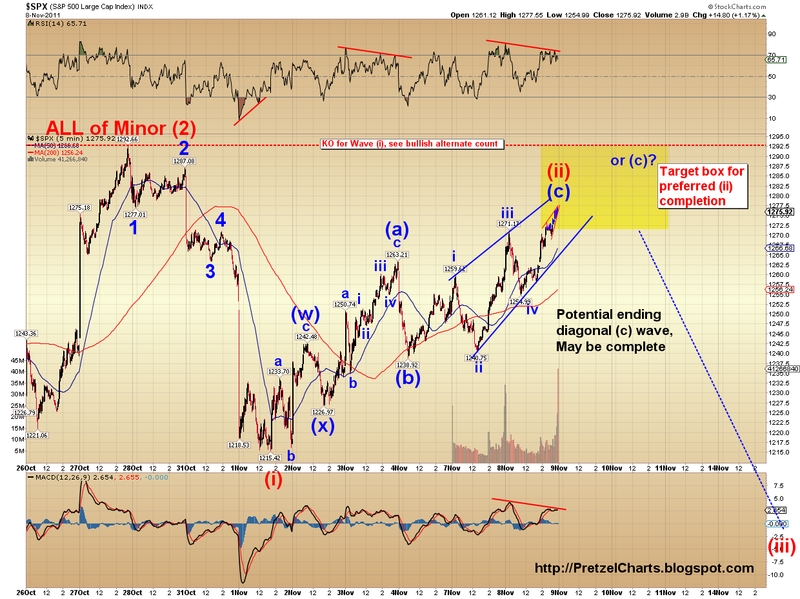 or the bullish case...this is a C of 2. chances are just enough to keep me considering it. Gotta tell you, everything is lining up for a big decline across multiple TA spectrums. Elliott is in agreement with Hurst is in agreement with MA disciplines, etc.. Everything is lining up perfectly, and it is literally screaming "Wave 3!" to me. Obviously, do what makes you comfortable, though. Not offering you trading advice! Just my humble, purely theoretical, opinion. I'll go into more detail w/ tomorrow's update, along with some key levels. As always, nothing on this site is to be taken as trading advice! No guarantees yet, bully still has a few areas from which to produce a last minute stick-save. I'll try to zero in on those with tomorrow's update. As far as a setup goes, though, while nothing is ever guaranteed (as I said), THIS IS AS GOOD AS IT GETS. Any chance you can post the ew analysis for the 2007-2008 bear market for educational purpose? Thanks. Well, my long term count chart shows how 2008 unfolded, and what each wave did. Click the "big picture" link in the above article. Beyond that, don't have much time to go into detail on 2008 right now. Let me know if that's what you were looking for. Sorry Pretzel I forgot the long term spx picture. Stupid me. 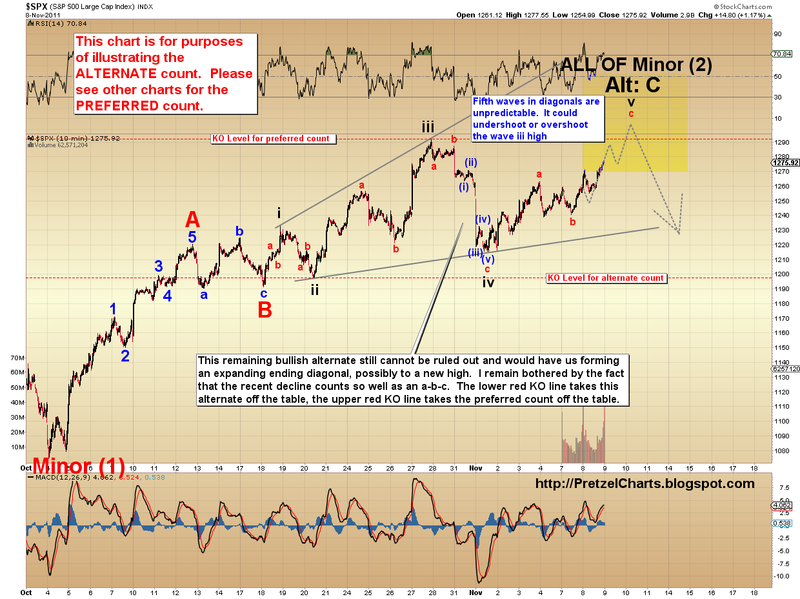 So we are at the start of wave 3 of (3), with wave (3) eventually undercutting the 3/09 low, correct? Basically, on that chart, we would be just under the blue (2) of 2008, now in the early stages of black 1 of wave (3). So black 1 of minor (3) should undercut oct4 low correct? Hahaha, I just read that the JSE is green because the ruling party in SA suspended its youth leader for 5 years this morning, subject to an appeal. Wonder what they'll say this afternoon when we turn red LOL. No doubt "risk aversion" and "European jitters"